There will be war between the United States and North Korea over the rogue nation's missile program if it continues to aim intercontinental ballistic missiles at America, Sen. Lindsey Graham, R-S.C., said President Donald Trump has told him. "He has told me that. I believe him," the lawmaker said Tuesday on TODAY. "If I were China, I would believe him, too, and do something about it." Graham said that Trump won't allow the regime of Kim Jong Un to have an ICBM with a nuclear weapon capability to "hit America." "If there’s going to be a war to stop [Kim Jong Un], it will be over there. If thousands die, they’re going to die over there. They’re not going to die here. And He has told me that to my face," Graham said. Military experts have said there are no good options for peacefully stopping North Korea, although the National Security Council has previously presented Trump with possibilities that could include putting American nukes in South Korea or killing Kim Jong Un. 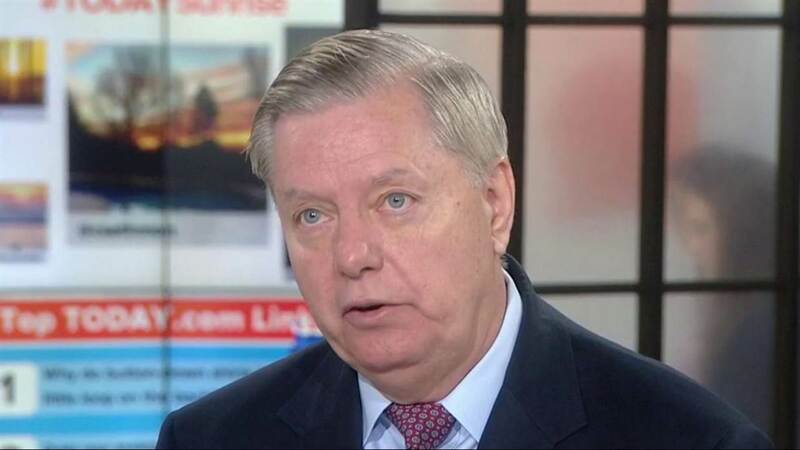 Graham said military experts are "wrong" that no good options exist. "There is a military option to destroy North Korea's program and North Korea itself," he added. Ultimately, a conflict in the region that would likely ensnare China and South Korea could claim millions of lives. North Korea first tested an ICBM on July 4, showing that it had a range of at least 3,500 miles — capable of reaching Alaska. The missile landed in the Sea of Japan. North Korea state television heralded the test missile as a "major celebration in our history" and that they are "now a proud nuclear state." The Pentagon announced Friday that the regime fired another ICBM, also landing in the Sea of Japan. The U.S. Chairman of the Joint Chiefs of Staff called his South Korean counterpart to discuss "military response options" and to express "the ironclad commitment to the U.S.-Republic of Korea alliance," a spokesman later said. In response to the test, the U.S. and South Korea held a joint live fire exercise Saturday morning. Pyongyang also confirmed the ICBM test launch, calling it a "stern warning" for the United States, Reuters reported. The Union of Concerned Scientists, a nonprofit science advocacy group, says estimates based on available information about the missile's trajectory showed it could "easily reach the U.S. West Coast and a number of major U.S. cities." Trump tweeted Saturday that China has done "nothing" to rein in North Korea, and Japan's prime minister said he "fully agreed" that China should apply more pressure. Ultimately, with North Korea showing no signs of slowing down its missiles testing, a military option can't be discounted, Graham said. "I'm saying it's inevitable unless North Korea changes because you're making our president pick between regional stability and homeland security," he added. "He's having to make a choice that no president wants to make. They kicked the can down the road for 20 years, there's no place else to kick it."